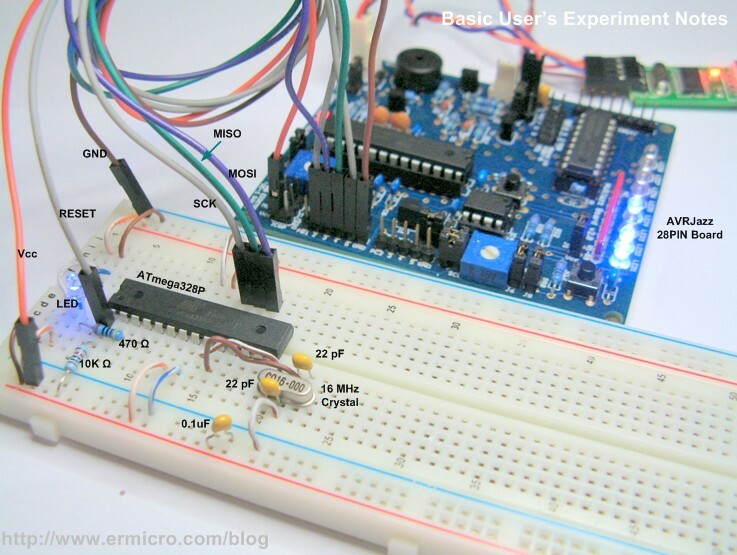 The “Basic User’s Experiment Note” is based on the popular 8-bit Atmel AVR ATmega328P microcontroller using AVRJazz 28PIN development board. This e-book covering most of the Atmel AVR ATmega328P microcontroller important features. With almost 140 pages, this e-book is organized similar to many of the ermicroblog’s project pages where it used many important information inside the Atmel AVR ATmega328P microcontroller datasheet to explained the experiments on each subject. The e-book is aimed for the beginners, hobbyist, or anyone who wants to learn and understand many of the 8-bit Atmel AVR ATmega328P microcontroller powerful features. Chapter 1 – Introduction: this chapter is a short introduction to microcontroller world, the AVRJazz 28PIN development board from ermicro and the software needed to accomplish all the experiments on this e-book. Chapter 7 – Serial Communication: using the AVR ATmega328P microcontroller UART feature, where you could send a command to the microcontroller from the PC using the PC terminal application. Chapter 18 – Using I2C EEPROM with Arduino: example of using the Arduino I2C library to connect to the Microchip 24AA128 I2C CMOS serial EEPROM. This chapter is similar to project on Chapter 15 and could be used as code comparison between coding using standard C code and Arduino sketch. Chapter 19 – Analog Comparator: take advantage of the AVR ATmega328P Analog Comparator peripheral to compare two analog inputs. Chapter 21 – Power Management: this chapter shows how we could use the Atmel AVR ATmega328P microcontroller power management feature to reduce the overall power consumption. Appendix A – Atmel AVR ATmega328P Minimum System: this is the extension of the chapter 22, where you could build the AVR ATmega328P microcontroller minimum system on breadboard in order to run many of the experiments presented in this note. The exercises will be presented at the end of each chapter to broaden the topics learned. The e-book includes the entire Atmel AVR Studio 6 source project (C code) and the videos for some of the experiments (downloadable from the link address above). Although all the experiments in this e-book used the AVRJazz 28PIN development board from ermicro, but you could apply all the experiments in this e-book to any AVR ATmega328P microcontroller board. 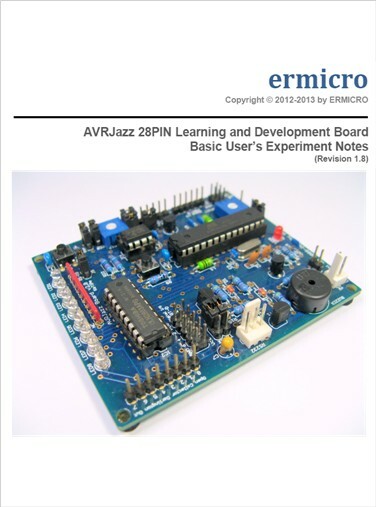 This e-book is included (free) to any purchase of the AVRJazz 28PIN development board from ermicro. You could also purchase this e-book separately (include all the source project) for just USD 5 (five US Dollar). Please send your request to the ermicro sales.